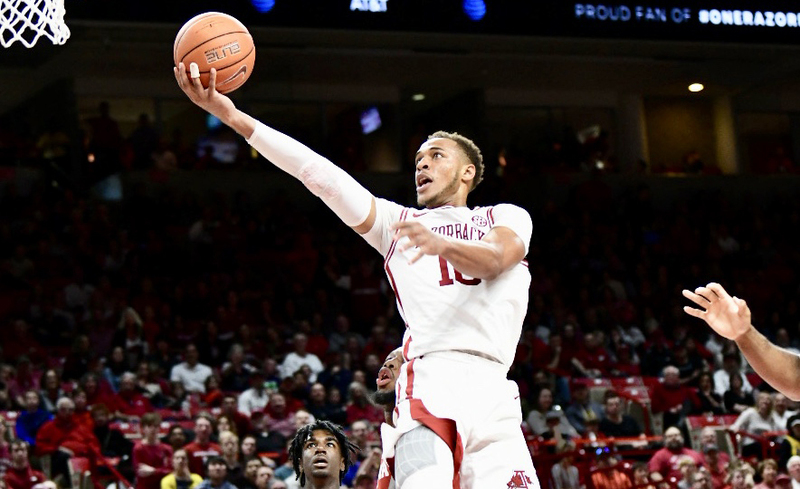 FAYETTEVILLE – Daniel Gafford, who had a double-double in the first half, became the first Razorback to have as many as 29 points and 16 rebounds in the same game versus SEC competition and led the Razorbacks to a convincing 82-70 win over Alabama in the teams’ 2018-19 regular-season finale Saturday evening at Bud Walton Arena. With the win, Arkansas (17-14, 8-10 SEC) secures a first-round bye at next week’s SEC Tournament as the ninth seed. The Razorbacks will face #8 seed Florida on Thursday (Mar. 14) at Noon in Nashville’s Bridgestone Arena. Gafford, who recorded his 10th double-double of the season, had a career-high 16 rebounds while his 29 points were the second-best output of his career. Gafford is also just the third player in the NCAA this season to have at least 29 points, 15 rebounds, two assists and two blocked shots in a game. Isaiah Joe finished with 15 points, had a career-high six steals and tied a career-high with six rebounds. Joe leads the SEC in both 3-pointers made (3.4) and 3-point percentage (42.9 – 106-OF-247) and is looking to join Tennessee’s Chris Lofton in 2005 – 3.0 made per game and 46.5 percent shooting (93-OF-200) – as the only freshmen to accomplish the feat. Also, Joe’s six steals versus Alabama tied for third in the school record book for most by a Razorbacks in an SEC game (record is seven by TJ Cleveland and Todd Day). The game was tight throughout the first half. The largest lead was five points by Arkansas when Keyshawn Embery-Simpson hit a 3-pointer with 43 seconds left. The triple put Arkansas up 36-31, which was the halftime score. Overall, the first half featured six ties and second lead changes. Gafford led all players with 11 points and 12 rebounds at the break. To open the second half, Gafford scored the first four points of the second half to force an Alabama timeout. Midway through the second half, Mason Jones hit 3-pointers on back-to-back trips to give the Razorbacks a pair of 12-point leads. The Crimson Tide got as close as seven points (56-49) with 7:45 left. Desi Sill answered with a 3-pointer to go up 10. From that point, Gafford scored 10 straight points for Razorbacks but Alabama kept up and Arkansas led by 12 with 3:47 left. Isaiah Joe took over from that point, hitting two free throws and making a 4-point play (3-pointer and free throw) to put the game out of reach. Sills added 11 points, making three 3-pointers. Arkansas led by two (8-6) at the first media timeout and game was tied at 17-17 at the second media timeout. Alabama led by one (26-25) at the third media time out. Arkansas led by two at the final media timeout (32-30). Overall, there were six ties and seven lead changes. Daniel Gafford had a game-high 12 points and game-high 11 rebounds for his 10th double-double of the season. Neither team got into the bonus in the first half as there were a combined 11 fouls called. Arkansas led by as many as 12 twice within the first nine minutes of the second half, both on Mason Jones 3-pointers. Jalen Harris had a high-flying, highlight-reel blocked shot at 5:12. On back-to-back trips inside of the five-minute mark, Daniel Gafford hit two free throws and hit a layup to give the Razorbacks a 13-point lead (67-54) at 4:27. Daniel Gafford scored 10 straight points for the Razorbacks at one stretch, including a coast-to-coast layup. Isaiah Joe got hot late and scored six straight to put the game out of reach. For the second game in a row, Jonathan Holmes made a 3-pointer for Arkansas’ final points of the game. Arkansas’ starters were Desi Sills (G) – Isaiah Joe (G) – Jalen Harris (G) – Daniel Gafford (F) – Gabe Osabuohien (F). It is the fifth straight game for this lineup. This also marks the fifth career starts for Sills and Osabuohien. Joe, Harris and Gafford have started all 31 games this season. Arkansas controlled the tip. Alabama’s Telvin Mack scored the first points at the 19:25 mark. Daniel Gafford scored the points for Arkansas, a jumper in the lane at 18:26. The win extends head coach Mike Anderson’s streak of never having a losing season to 17 years. Anderson is one of four coaches in the NCAA to have at least 15 years of head coaching experience and never have a losing season, joining Roy Williams (North Carolina), Tom Izzo (Michigan State) and Mark Few (Gonzaga). For the sixth year in a row, Arkansas has exceeded the preseason coaches poll. The Razorbacks were picked to finish 10th by the league’s coaches but finished ninth this year. Arkansas only committed three first-half turnovers and just eight for the game. Arkansas did not draw a charge versus Alabama, snapping an 18-game streak with at least one charge. Isaiah Joe has 106 3-pointers made this season. He only needs to make three more to rank sixth on the NCAA single-season list for 3-pointers made in a season by a freshman. Joe, who ranks second for most 3-pointers made by a freshman in SEC history, is seven triples shy of Kentucky’s Jamal Murray mark. Murray made 113 treys in 2016 to set the SEC freshman record.